If your garage door opener is showing signs of some type of malfunction, you'll want to reach out to our experts as quickly as you can. There are a lot of electric and mechanical parts involved in the operation of this device, and fixing any of them can be complicated and potentially even dangerous as well. Your opener uses a motor in order to create the horsepower necessary to allow your door to move. If even only one of the gears breaks or wears out, you'll probably hear a strange whirring sound, and find that your opener can't open your door. Trying to replace the damaged gear can cause you a digit if you're not careful, so you better leave it up to our specialized team. Whether the issue lies with the power socket or some section of the interior circuit board, you'd best let our technicians handle it. Dealing with electrical components is always risky, especially if you aren't trained to do so. Even one loose wire can cause your opener to misbehave. Fortunately, our team has a lot of experience restoring the proper operation of these types of devices, and will be more than happy to come and help you out. Your opener uses a pair of safety sensors in order to keep it from closing the door on someone or something. That means that if there is a person or an object blocking the door's path, the system should reverse its operation and not hit that obstacle. The photo-electric "eyes" that your opener uses to "see" send an infra-red beam across garage's threshold. When that beam breaks, your opener "knows" there's something under the door. If these components become misaligned, however, then they may fail to detect an obstacle. 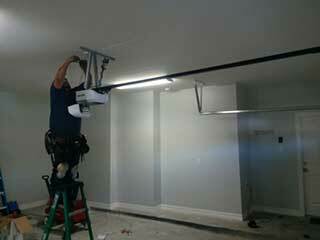 Our technicians can realign your safety sensors and make sure they are positioned correctly. Regardless of what type of opener related problem you may be experiencing, our team can handle it. Garage Door Repair Diamond Bar is here to help you whenever you need us. Contact us today.